The true origin of the martini is draped in mystery! There are differing arguments as to who was the first to create the Classic Martini. Many who claim to have created the first Martini have varying recipes and names, but no version exactly fits the Martini recipe that we know today. The modern day Dry Martini consists of Gin and a varying amount of dry white Vermouth. The dry vermouth is adjusted to the taste of the guest, since some guests like their martinis wetter than others. An olive, a twist of lemon rind, or a cocktail onion are all acceptable as a garnish. The most detailed historical claim begins with a cocktail named the Martinez, which was created around 1862. This particular drink of the time called for 4 parts red, sweet Vermouth to 1 part Gin, which was then garnished with a cherry. The first version of a martini included aromatic bitters and Old Tom Gin, which was very sweet and incorporated a strong Juniper flavour. The Martini gradually transformed into what we now consider to be the modern Martini. Over time, the classic cocktail changed. Old Tom Gin was replaced with London Dry, then Orange Bitters took the place of the aromatic bitters. Aficionados began to replace the red Vermouth with a white, dry Vermouth. The proportions of the drink eventually became equal parts and soon the Dry Martini appeared, olive included. If you don’t buy that story, perhaps some of these are more convincing! Julio Richelieu mixed small drinks at his saloon in Martinez, California for visiting miners back in 1870. Julio placed an olive in the glass before handing it to the man, then named it after his town. 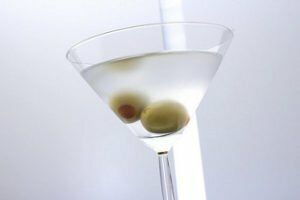 Martinez, California continues to hold claim as the birth place of the Martini. Jerry Thomas of San Francisco printed a bartending book in 1887 with a Martinez recipe. It called for one dash of Bitters, two dashes of Maraschino, one wine glass of Vermouth. The drink was chilled with two jigs of ice, then completed with a pony of Old Tom Gin. The drink was served with a slice of lemon. Finally, in 1911 at the Knickerbocker Hotel in New York the head bartender, a gentleman by the name of Martini di Arma di Taggia, mixed half and half London Gin, Noilly Prat Vermouth and orange bitters. He chilled the drink on ice and strained it into a well chilled glass. Many visitors to the Knickerbocker asked for variations of the drink, then added the olive. Regardless of the true origin, the quest for the perfect Martini will no doubt continue. Martini bars continue to hit the scene and variations of the Martini abound. In the new millennium, it may seem that anything presented in a Martini Glass is considered to be a Martini. While that may or may not be true, we advise that you enjoy the moment! If it tastes good, it’ll taste even better in a martini glass! Stir well, being careful not to break up the ice. 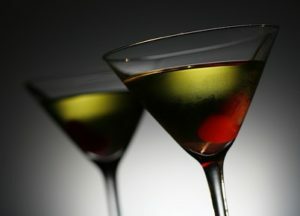 The ‘wetness’ of a martini is determined by how much dry vermouth is added to the cocktail. A Wet Martini will contain 1/2 oz of dry vermouth and 1-1/2 ounces of Gin. A super extra dry gin martini requires the bartender to only look at the bottle of dry vermouth. Different cocktail bars will add their dry vermouth in very particular ways. Some may infuse a toothpick and serve that extra dry martini with the wooden skewer set inside the edge of the glass. Other bartenders may have their vermouth in a spritzer to add only a mist to the surface of the cocktail. Get creative with your martini making. We teach our bartending students a few different ways to whip up a tasty gin martini, so check out more of our fun cocktail recipes, including 8 different vodka based martinis.